Pyroxenite is an ultramafic plutonic igneous rock. Ultramafic means that more than 90% of the rock is composed of magnesium- and iron-rich minerals like pyroxenes, amphiboles, and olivine. In pyroxenite the dominant mafic mineral is a pyroxene. 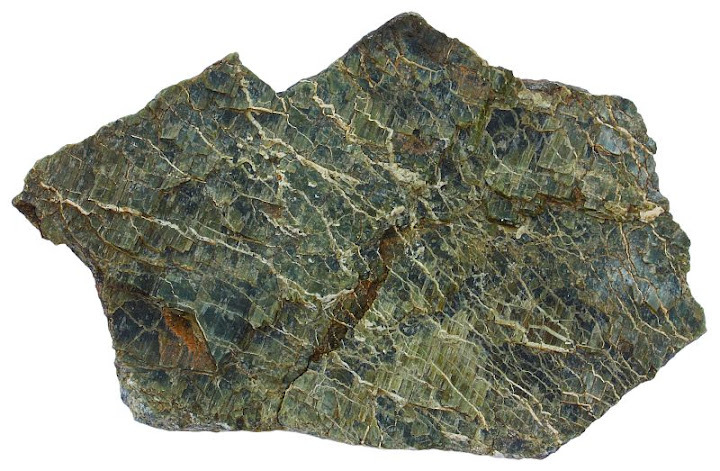 Pyroxenite may contain up to 40% olivine. More than that means that the rock is peridotite. 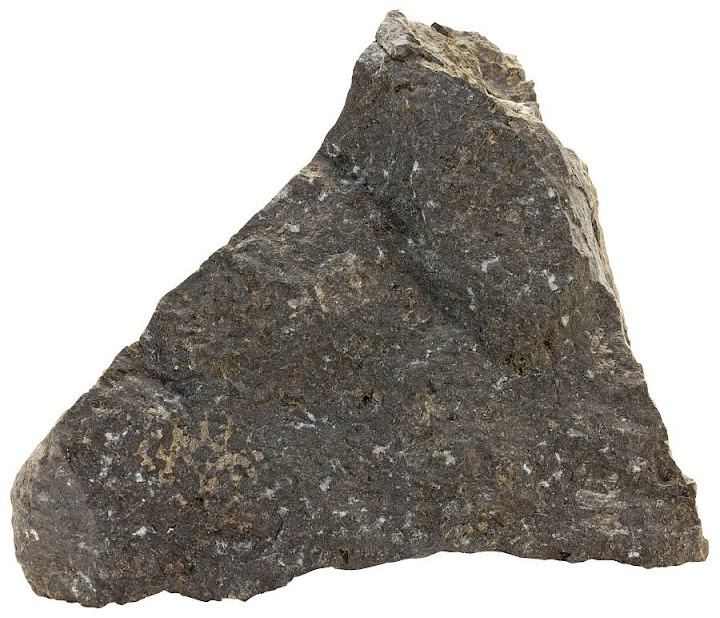 If felsic minerals like feldspars constitute more than 10% of the rock, it is melanocratic gabbro. Hornblendite is a similar igneous rock, but it is composed of amphiboles instead of pyroxenes. Pyroxenite may be almost monomineralic pyroxene rock. Hullvann, Norway. Width of sample 8 cm. Pyroxenite is uncommon at the surface because it occurs predominantly deep in the crust or in the mantle and it is susceptible to both metasomatic alteration and weathering. It usually occurs together in the same igneous complex with peridotite. Pyroxenite mostly forms by accumulation of pyroxene crystals in the mafic-ultramafic igneous intrusions. It forms variously shaped igneous bodies like sills, layers, dikes, etc. Pyroxenite is a common rock in the lower part of the oceanic crust, where it is associated with depleted peridotite. “Depleted” means that peridotite has gone through partial melting to yield basaltic melt, which forms the upper part of the oceanic crust (sheeted dikes and pillow lavas). 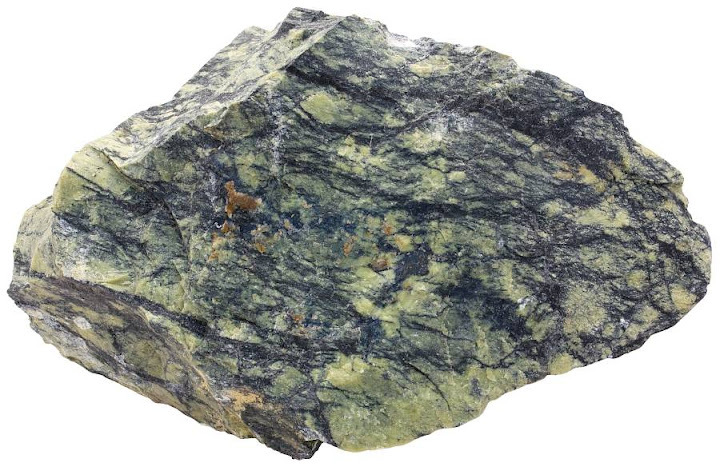 Depleted peridotite is rich in orthopyroxene (harzburgite) and associated pyroxenites are usually either orthopyroxenites or olivine orthopyroxenites. Pyroxenite may occur as xenoliths in volcanic rocks. Metamorphic rocks with a pyroxenite composition should be named differently. 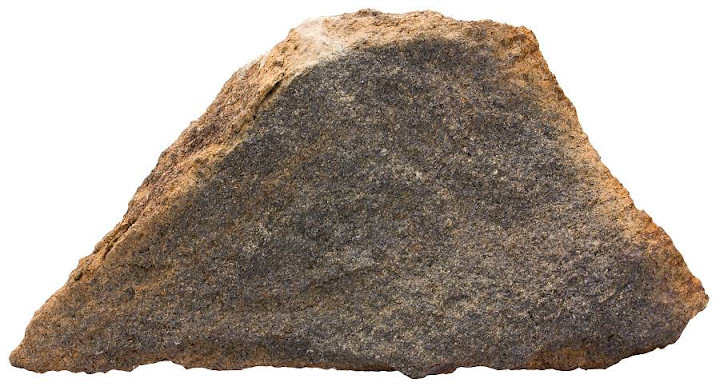 These rocks are usually high-grade granulites (granofelses). 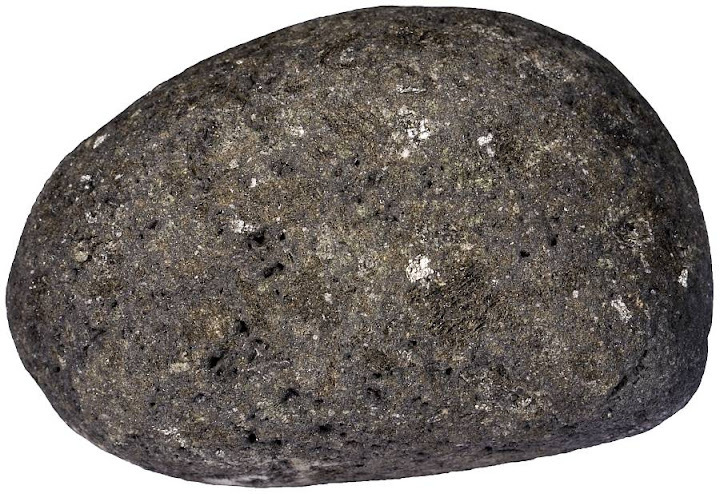 The rock name pyroxenite should be reserved to true igneous rocks to avoid unwanted confusion and ambiguity. Pyroxenite and peridotite may host economically important metals like chromium, nickel, platinum, iridium, osmium, etc. Serpentine and talc are mined from metamorphosed ultramafic rocks. A classification diagram of ultramafic rocks. Pyroxenite is yellow, peridotite white. 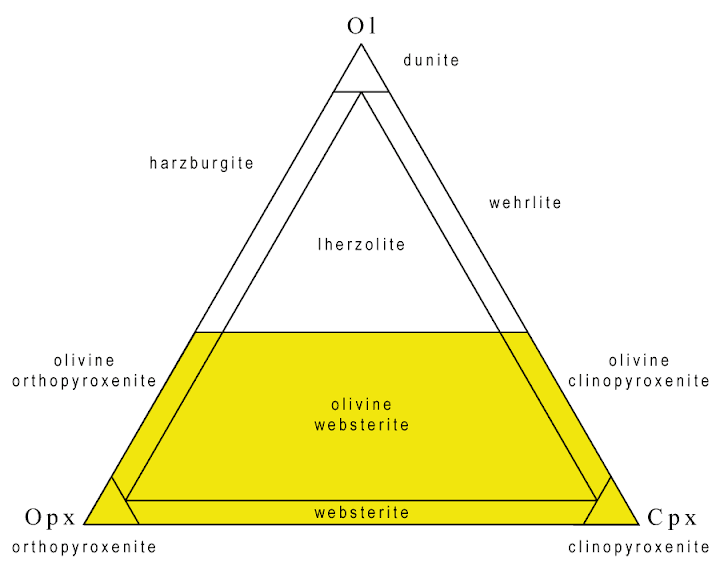 Pyroxenite is divided into sub-types: orthopyroxenite (>90% orthopyroxene), clinopyroxenite (>90% clinopyroxene), websterite (both clino- and orthopyroxene in significant amount (>10%) but less than 10% olivine), olivine orthopyroxenite (orthopyroxene, less than 10% clinopyroxene, 10-40% olivine), olivine clinopyroxenite (clinopyroxene, less than 10% orthopyroxene, 10-40% olivine), olivine websterite (less than 40% olivine, both clino- and orthopyroxene more than 10%). Only olivine and pyroxenes are included in these calculations. 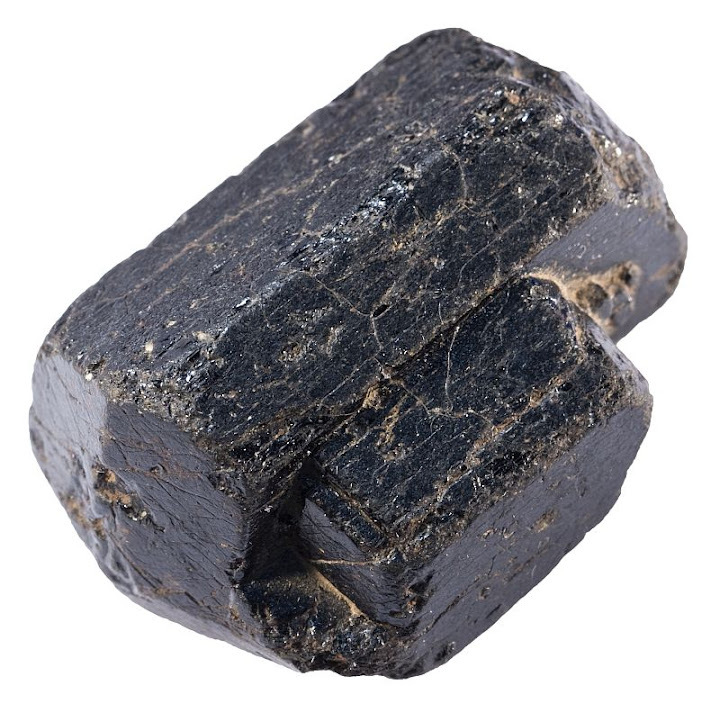 All other constituent minerals are neglected only hornblende is included if it forms a significant part of the rock1. Augite is a common (monoclinic) member of the pyroxene group that occurs frequently in pyroxenites. Width of sample 35 mm. Orthopyroxenes are also very common in pyroxenites. They may be recognizable by brown sub-metallic luster (crystals in the lower left), but in many cases orthopyroxenes and clinopyroxenes are indistinguishable in hand sample. 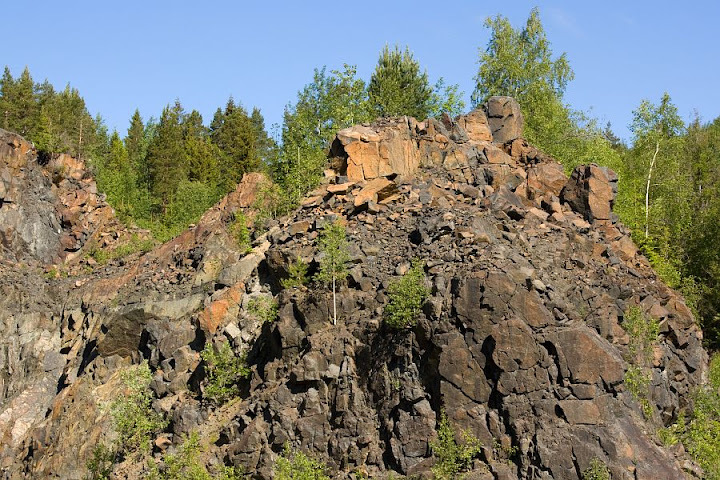 Kemi, Finland (host rock of chromite). Width of sample 12 cm. Ultramafic rocks are usually dark-colored. They may be yellowish or greenish when altered or weathered. An outcrop of peridotite-pyroxenite. Hullvann, Norway. Xenolith of pyroxenite in trachytic host rock. Width of the xenolith from La Palma is 7 cm. Olivine orthopyroxenite. Olivine is a common constituent in pyroxenite. The boundary between pyroxenite and peridotite is arbitrarily set at 40% olivine. Tappeluft, Norway. Width of sample 17 cm. Pyroxenite pebble on the southern coast of La Palma, Canary Islands. Width of sample 6 cm. Olivine orthopyroxenite. Tappeluft, Norway. Width of sample 16 cm. Pyroxenite does not need to be black or dull-colored. Sometimes it may be colorful when it contains garnet and pyroxene is bright green chromian diopside. Pyroxenite often forms cumulate layers in ultramafic intrusions. Yellow mineral is olivine and the rock is peridotite. Lower pyroxenite layer is about 5 cm thick. Åheim, Norway. Pyroxenite layer in peridotite. Width of view is about 30 cm. Åheim, Norway. 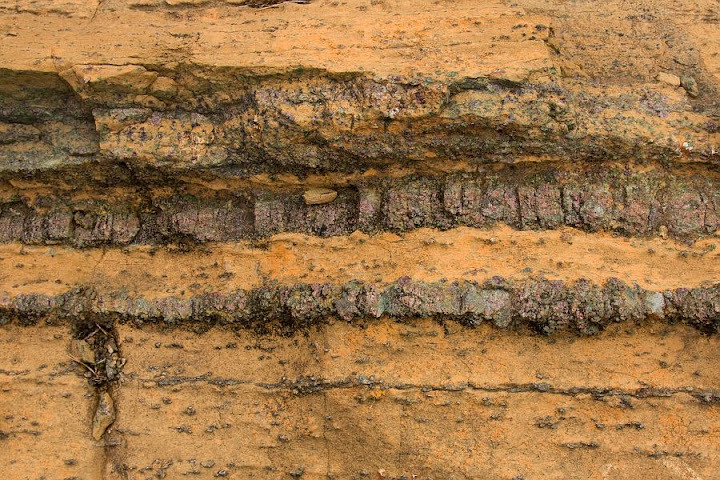 An outcrop of layered ultramafic rocks (folded pyroxenite layers in peridotite). 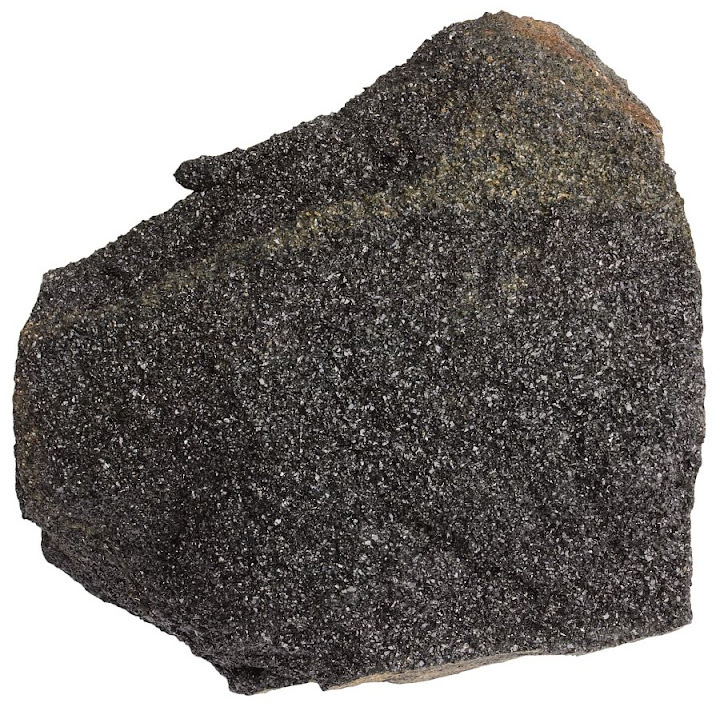 Chromite is a common accessory mineral in ultramafic rocks, including pyroxenite. These chromite crystals come from pegmatitic pyroxenite from the Rustenburg mine, Western Bushveld, South Africa. Width of view 5 mm. Pyroxenitic rocks get easily altered (metamorphosed) to serpentinite. 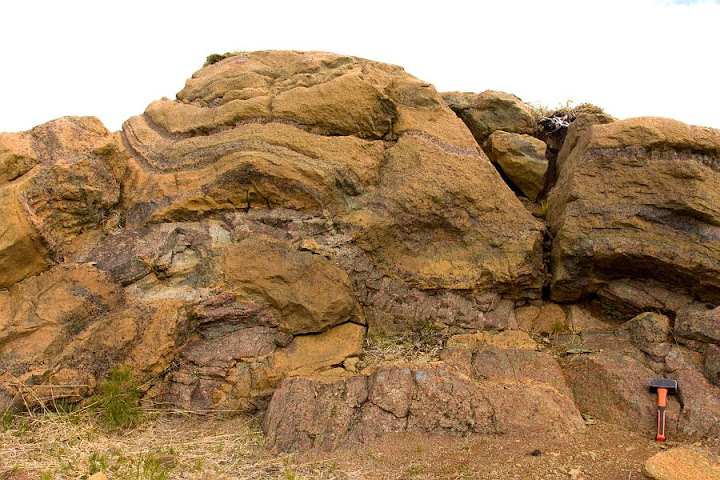 Troodos ophiolite, Cyprus. Width of sample 11 cm. Hornblendite is a similar ultramafic igneous rock, but the mafic minerals are amphiboles. Amphiboles are hydrous minerals. The formation of amphiboles over pyroxenes is favored if the magma is rich in water fluid. Alternatively, such rocks may be a result of later hydrothermal metamorphism, but in this case they should be named melanocratic amphibolites. 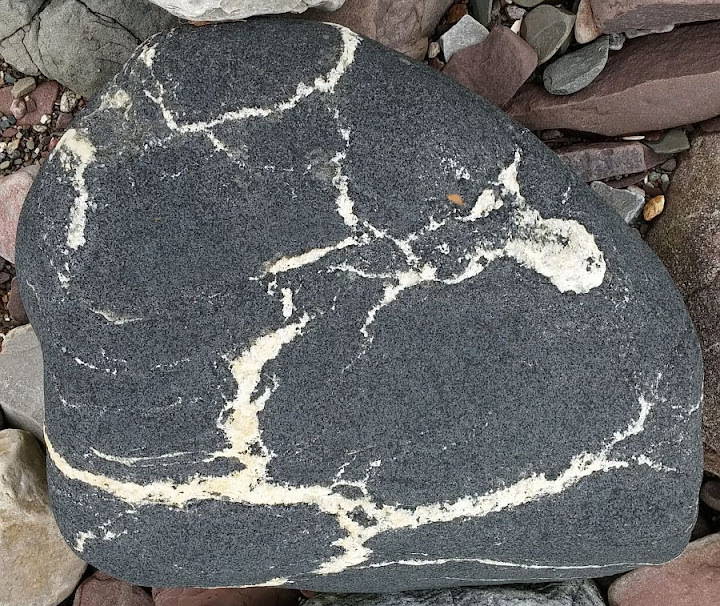 White veins are magmatic — they are composed of feldspar and quartz. Varanger, Norway. Width of sample 50 cm. 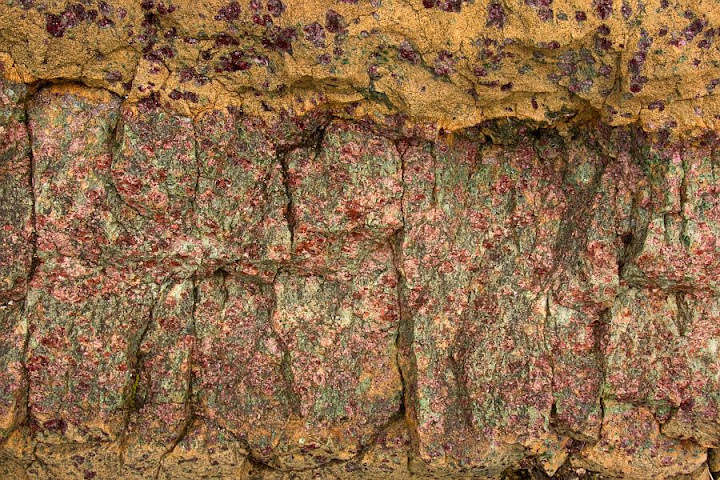 This rock is composed of garnet and green pyroxene omphacite. Is it a pyroxenite? No, it is a result of ultrahigh-pressure metamorphism and the rock is eclogite. Holsnøy, Norway. Width of sample 9 cm. This rock is composed of pyroxene group mineral hedenbergite with serpentine. Is it partly serpentinized pyroxenite? No, it is not. Both serpentine and pyroxene here are part of a skarn. This is a contact-metasomatic rock that forms when carbonate rocks react with hot fluids from igneous intrusions. Serpentine as a Mg-rich mineral suggests that the carbonate country rock was probably dolomite. Tapuli, Sweden. Width of sample 13 cm. 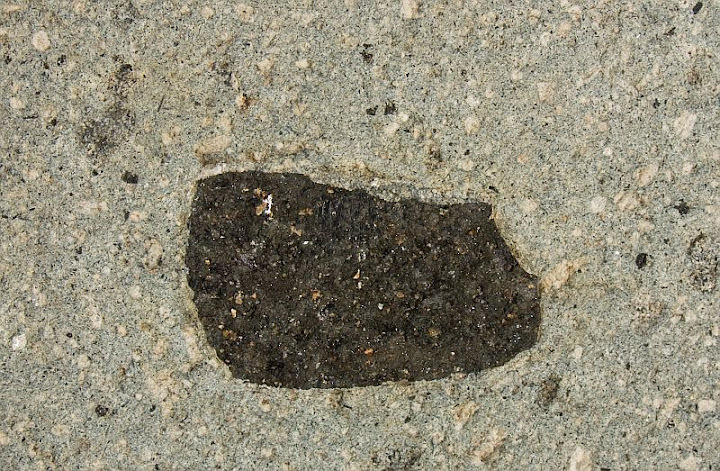 Pyroxene (mostly orthopyroxene here, see brown reflections from the cleavage surfaces) is a common mineral in high-grade metamorphic rocks of granulite facies (a red mineral is garnet). Pyroxene is common in these rocks because it is anhydrous. 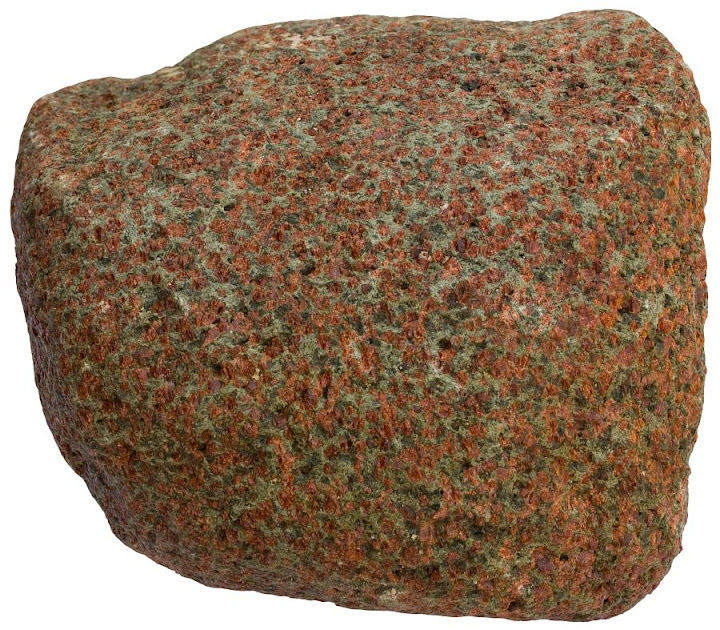 Sometimes such rocks are named pyroxenites. This is what they are purely compositionally but this practice is not recommended. It goes against the logic of rock classifications that aim, if possible, to sort rocks into different types by their genesis, not by their look or composition. There are some reasonable exceptions, but naming metamorphic rocks according to igneous nomenclature is anything but reasonable. 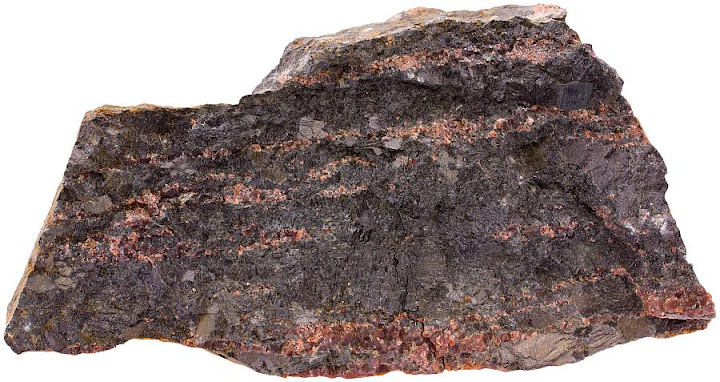 This rock is garnet-orthopyroxene granofels or granulite although the latter term is problematic too because of associations with metamorphic facies of the same name. Holsnøy, Norway. Width of sample 13 cm. 1. Le Maitre, R. W. (2005). Igneous Rocks: A Classification and Glossary of Terms: Recommendations of the International Union of Geological Sciences Subcommission on the Systematics of Igneous Rocks , 2nd Edition. Cambridge University Press.